Knee pain is a common problem among young adults, older adults and children. Women mostly are the victims of knee pain as compare to the men. Knee pain is due to the constant moves of the knee joint. 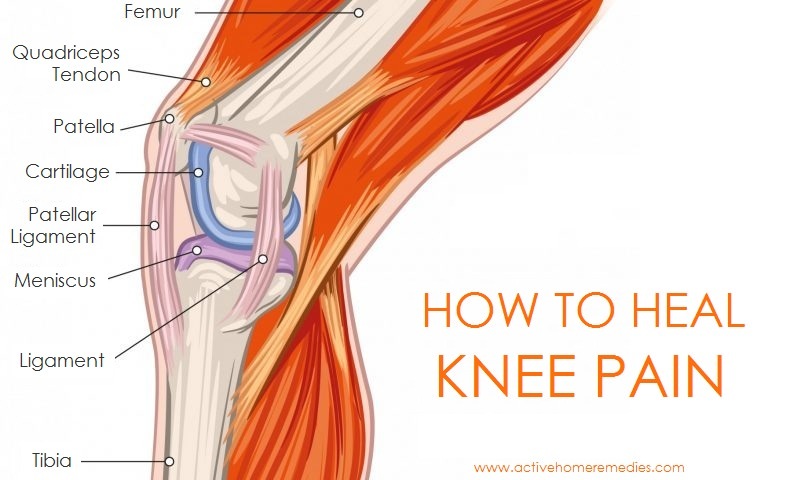 The location of knee pain varies from one part to another. The pain can be originated from the parts of the knee joint like the bony structures (femur, tibia, and fibula). Sometimes it comes from the kneecap (patella) or the ligaments and cartilage (meniscus). The contraction and extension of the knee muscles can also cause pain and the pain can be severe by the passing time. The main reason behind this knee pain is the weak bone structure and wear and tear due to aging factor. Some other causes might be the ligament injuries, fractures, dislocation of the knee joint, stiffness in the joint due to the arthritis, and other chronic illnesses. 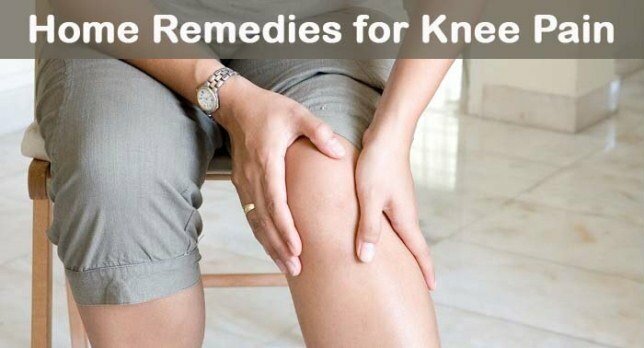 You can feel the knee pain having the symptoms such as noticeable swelling on the knees, numbness in the entire leg, redness, and stiffness in the knee, difficulty in walking, sitting, and standing. Cold compress can be applied to the painful knee which is the easiest remedy to reduce pain and swelling. Cold compress is beneficial as it helps in reducing the blood flow to the affected area and it will give you relief from the pain. Apply the compress to the affected knee for 20 minutes. Do this three times daily until you feel the pain is gone. On the other hand, frozen peas when filled in a bag can also work as a cold compress. Apple cider vinegar is one of the best remedies for reducing the knee pain. It has alkaline effect and it helps in dissolving the mineral building ups and harmful toxins within the knee joint. In two cups of filtered water, add two tsps. of apple cider vinegar and sip this mixture throughout the day. You would have to drink this tonic until you feel recovery. You have an option to add two cups of apple cider vinegar in a bath tub or bath water. Soak your affected knee in the water for at least 30 minutes. Do this process daily for few days. Also, you can mix one tbsp. of apple cider vinegar with one tbsp. of olive oil. Massage your affected knee with this mixture two times daily. Cayenne pepper has a compound called capsaicin which greatly works as a pain reliever. Capsaicin contains natural pain-relieving properties that produces a warm sensation or heat and reduce the knee pain. Add two tbsps. of cayenne pepper powder in one-half cup of warm olive oil. Apply this paste on the knee daily for one week. Take a cup of apple cider vinegar then mix one-quarter tsp of cayenne pepper powder in it. Soak a clean washcloth in this solution then apply on the affected area for about 20 minutes. Do this two times daily until you notice the inflammation is gone. You can apply 0.0125 percent of capsaicin gel to reduce the knee pain. Ginger helps in reducing the knee pain caused due to the arthritis, muscle injury or muscle strain. Ginger contains anti-inflammatory properties due to which is reduces the swelling on the knee and pain in knee joint. Cut small piece of fresh ginger root and add it in one cup of water then boil for at least 10 minutes. Strain this solution and add little honey or you can add lemon juice. Drink three cups of this ginger tea daily for reducing the pain. You can also use ginger oil to massage on the knees daily until you are satisfied with the results. Turmeric is an effective natural remedy for relieving the knee pain. It contains a chemical called curcumin which has anti-inflammatory and antioxidant properties. According to the Center for Complementary and Alternative Medicine (NCCAM) reveals that turmeric works to slow down the progression of rheumatoid arthritis which is one of the main causes of knee pain. In a cup of water, add one-half tsps. of each ground ginger and turmeric then boil it for 10 minutes. Strain the solution and little amount of honey to taste. Enjoy this drink two times daily. In a glass of milk, boil one tsps. of turmeric powder. Sweeten the drink with some honey and drink only once daily. You can also take 250 to 500 mg of turmeric capsules three times daily. Lemon is also beneficial for the treatment of knee pain caused by the arthritis. Lemon contains citric acid which works as a solvent for uric acid crystals that is the common cause of arthritis. Cut two lemons into small pieces. Take a cotton cloth and tie those pieces in it then dip in warm sesame oil. Place this cotton cloth on the affected knee for at least 10 minutes. Do this remedy twice daily until the pain is gone. Mustard oil is an old age remedy in Ayurveda. If you massage the painful knee with warm mustard oil helps in eases the inflammation, helps in the proper blood circulation and relieves the knee pain. Heat two tbsps. of mustard oil. Now fry one clove of garlic (chopped) until it turns into brown color. Cool the oil and strain it. Massage your aching knee with this lukewarm oil in circular motions. Cover the knee using plastic wrap to apply the heat for few minutes. Do this remedy daily for two weeks. Epsom salt contains magnesium sulfate which helps in relieving the knee pain. It works as a natural muscle relaxant and removes the excess fluid from the tissues thus reducing the inflammation and swelling. In a hot bath water, add one-half cup of Epsom salt then stir well. Soak your affected knee in this warm solution for at least 15 minutes. Do this remedy few times a week until you get complete relief from the pain. Note: this remedy is not suitable for those persons suffering from the heart problems, high blood pressure or diabetes. Fenugreek seeds have anti-inflammatory and antioxidant properties thus it is helpful in reducing the knee pain. Fenugreek seeds are warm in nature and considered so much constructive for knee pain and arthritis. Add one tsp of fenugreek seeds in filtered water to soak overnight. In the next morning, strain off the water and munch on the seeds. Do this process daily for two weeks. Take a handful of fenugreek seeds, roast and grind them and store in an airtight jar. Now mix two tsps. of this powder in enough water as to make a thick paste. Apply this paste on the affected knee and leave for 30 minutes. After that, wash off your knee with warm water. Use this paste two times daily for a week. Eucalyptus oil has analgesic and pain-relieving properties which is good to treat a knee pain. Eucalyptus oil contains a cooling effect and can ease the pain due to the arthritis. According to the study shown in the Alternative Medicine indicates that if you inhale this essential oil, it will reduce pain and inflammation after total knee replacement. Blend seven drops of each eucalyptus oil and peppermint oil then mix it in two tbsps. of olive oil. Store this mixture in a dark glass bottle, keep it away from the sunlight. Rub this mixture onto your knees whenever it feels aching. Massage with the gentle motions of your hands so the oil gets absorbed into the skin. Exercise daily to lose extra weight. Wear right kind of shoes and sandals. Take magnesium and omega-3 supplements daily. Go for a brisk walk for 15 minutes. Do not smoke as it slows down the healing process. Drink more and more water to soften up the cartilage and to keep yourself hydrated. Keep your legs in an elevated position to help reduce swelling and pain.